The epic franchise that is Toy Story started out as simply a movie about toys. (No spoilers just in case you still haven’t seen it.) Some toys in the movie were originally fictional but now exist in the flesh (plastic). With the dawn of the iOS age we saw the creation of apps that star these toys and now we play apps about toys that were made-up stars of wildly popular movies. Well played, Disney and Pixar – my kids now think that Buzz and Woody make the world turn. 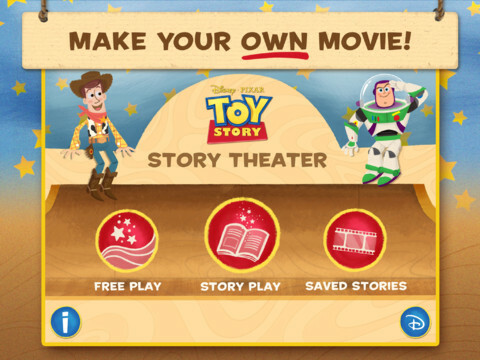 If your kids have loved the cowboy hat right off the head of their Woody doll, you can download Toy Story: Story Theater. 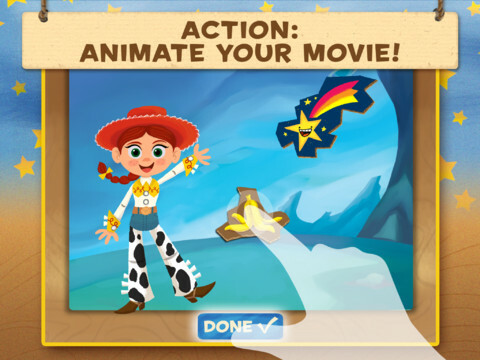 This creativity-boosting app lets kids play with virtual dolls and save the stories they create using the sights and sounds from the movies. Different skills sets – imaginative play and early literacy development to name a few – are addressed in a fun way. There are two modes to choose from: Free Play and Story Play. Free Play lets kiddos choose characters, backgrounds, events, and music, and assemble them in an open-ended way and record their voice narrating the story. Figures can be moved, enlarged, shrunk down – you name it. The play in this mode truly is play, and best serves the older school-aged player with a wild imagination. Story Play has a little more structure for players on the younger end of the suggested age range. The characters, settings, and events are limited to only a few choices. Stories begin with simple sentences narrated for players to help get them on the right track. It still offers a great deal of creativity, but fewer options mean that younger players will get less flustered or overwhelmed. My 5-year-old son decided for a while what his name was Andy and his 3-year-old sister would go by Molly, and that gives you a good indication of how much they love Toy Story. Having creative control over the storylines thrilled them; everything was oversized, over-exaggerated. The most exciting part, though, was that they could actually save their stories to e-mail them to Dad at work. 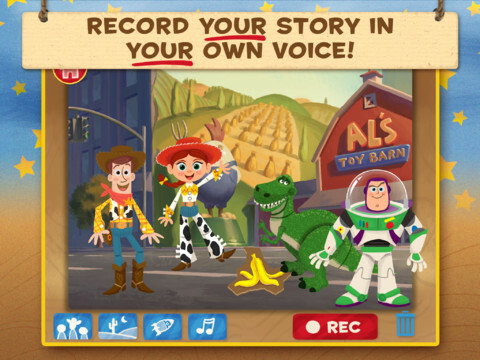 Don’t get me wrong – using “real” toys in make-believe play is something that can’t (and shouldn’t) be replaced by apps, but Toy Story: Story Theater is the best virtual representation of actual imaginative and creative play. The download price of $2.99 is peanuts compared to what kids can really get out of playing this app. We think it’s an All Star and we’re pretty sure you will too, space rangers! This might be the rootinest tootinest story-telling app we’ve seen in a while!